When you’ve only got 30 minutes to deliver a pizza, you better have a little magic on your side. Ever the innovators, Domino’s Pizza, the inventor of the Pizza Tracker, is training reindeer to deliver pizza. According to a press release from Domino’s Japan, they have begun testing reindeer to deliver pizza, cheesy bread, wings, and ice-cold Coca-Cola products right to your doorstep. The animals will be equipped with a GPS, so customers can track the reindeer’s course via smart phone. By the looks of this video, the reindeers, who are transported in a small crate, are treated much better than on the North Pole and genuinely want to deliver pizza. No word yet on if bad tippers get coal instead of pizza. Also, no confirmation on whether or not this is just a hoax or a piece of viral marketing. The press release promises an update on Thursday. Let’s just hope these reindeer are quick enough to "avoid the Noid." Hide yo kids, hide wives, hide yo husbands, and definitely hide yo grandmas. The only way we could make this very real life story of a reindeer running amok through the tea-soaked streets of a temporarily improper Nottingham, is if Arnold Shwarzznegger reprised his role from Jingle All The Way, to catch the runaway reindeer. Somebody must've slipped something in Bjorn the reindeer's eggnog Sunday, because he went buckwild. 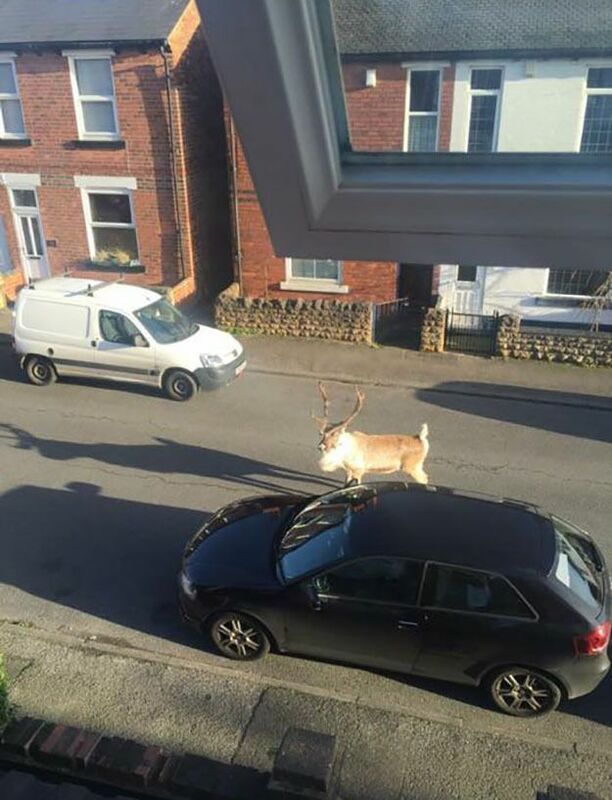 "I was putting some Christmas cards up in the window and just saw it come charging down the street," local resident Gemma Green told the Nottingham Post. "Then I saw a group of people following it. "It was quite strange. It's like the scene from Arthur Christmas where Santa loses his reindeer. I thought I was seeing things at first." Maybe she was, but heck if that's a way to spur some Christmas spirit.